We are a friendly scuba diving club based at Pingles Leisure Centre in Nuneaton, Warwickshire. Our aim is to provide opportunities for everyone to experience the wonders that lie beneath our seas, whether you are a nervous beginner, or are already a veteran. We welcome adults who have never dived before and who want to learn, as well as divers who have already qualified, regardless of their training agency. Our knowledgable instructor team can help you develop the skills you need for almost any diving objective. The club meets every week, dives together regularly, and today continues to provide safe and adventurous diving experiences for all our members. So why wait? – come and join us! 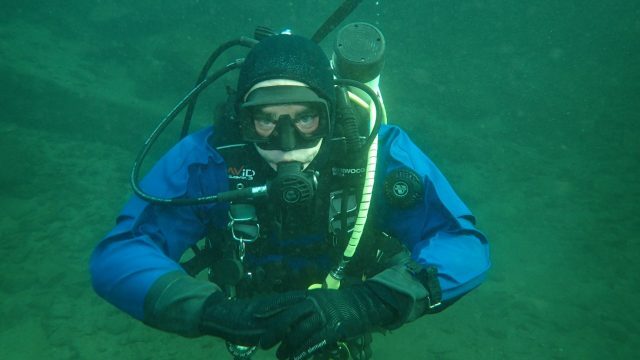 Martin, Rob and Garry travel to Plymouth for a weekend’s cold water diving with In Deep. On 22nd December Martin, Rob, Garry, Mike W, and Sue braved the icy water, while Cathy provided surface cover, at our annual Christmas dip at Stoney Cove!